Ralph of Diceto (d. 1202) gained an education in Paris, and became a dean of St. Paul's Cathedral in 1180. He wrote two historical works covering his lifetime, both contained in this manuscript, which was owned by St. Albans abbey in the Middle Ages. 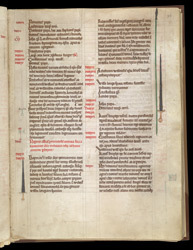 In the margins of this page are visual indexing symbols, explained at the beginning of the text. The swords, for example, are next to passages referring to dukes of Normandy.